Louvre reopens in Paris on Monday, Nov. 16, 2015, following deadly terrorist attacks from ISIS. PARIS (KABC) -- France took a monumental step forward on Monday, relighting the Eiffel Tower and opening several historical landmarks for the first time since the terrorist attack on Friday. Both the Eiffel Tower and the Louvre are must-see sights in the French capital, but have been inaccessible for days following an attack by ISIS terrorists that claimed the lives of 129 people. "We've been here for about six days now and been through all of what's happened and have been turned down at several different places that haven't been open yet," said Tim Thompson of San Clemente. "The day that it happened we were riding the next morning on the metro and we ran across a couple of young women who were very emotionally upset and you could tell the city was really suffering." At noon, visitors and locals spontaneously found each other at the base of the Eiffel Tower and locked hands in a large circle. A massive truck blew its horn and strangers observed two minutes of silence, showing Paris it's not alone in the fight against terrorism. 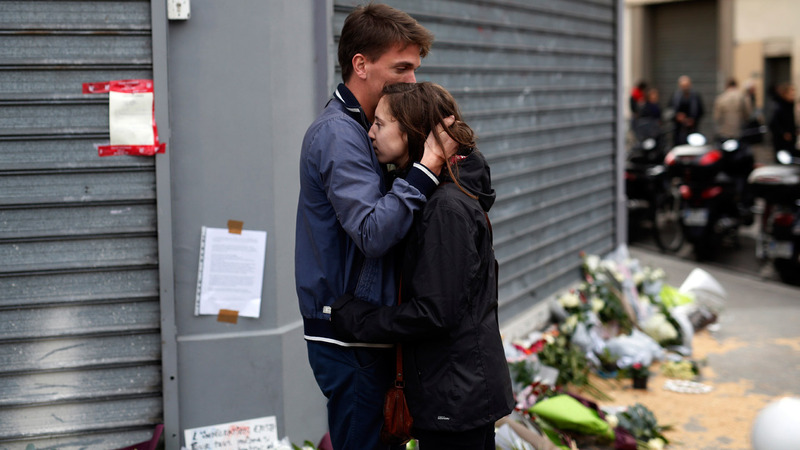 "With the military and police presence everywhere, we're just showing our support and we're here for the Parisians and obviously we're able to take part in an event like this so it's good to look back on I think," Rick Smythe of Australia said. French President Francois Hollande vowed to create a coalition capable of defeating ISIS, calling Friday's attacks an "act of war." Along with the 129 people killed, 350 were injured in the attacks.